As part of our day trip we were Gold sponsors, along with our partner Lysis Operations, at the ACAMS Anti-Financial Crime Symposium taking place at the Radisson Blu in the city. 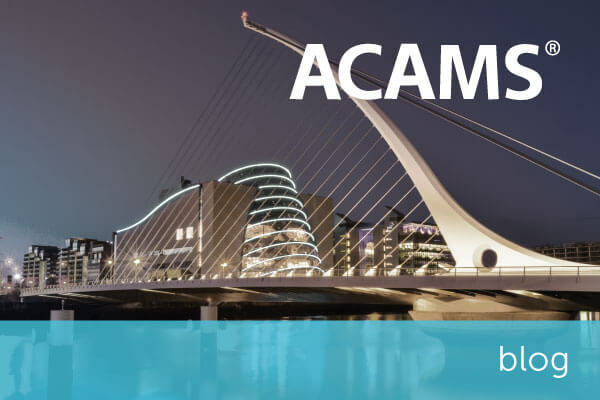 The ACAMS conference is one we have attended repeatedly over the last few years and have continually found it to be one of the most engaging and well put together financial crime conferences on our yearly agenda. Knowing the quality of this event as we did, the caliber of speaker and attendees, we decided to show our support by partnering with ACAMS and taking out Gold level sponsorship. This year we were confident of another excellent event. Speaking on the day to give their viewpoints on financial crime were the likes of Domhnall Cullinan, Head of Anti-Money Laundering Division, Central Bank of Ireland; Mark Bonham, Senior compliance programme manager, Airbnb Payments; Paul Ryan, senior director global compliance investigations, Paypal, and; Chloe Cina, UK Head of Sanctions Regulatory & Complex Advisory, HSBC Bank. The day was structured around four major themes. They were, the role that law enforcement plays, and how it continually reviews and updates procedure to catch criminals; Politically Exposed Persons (PEPs) and what banks need to be wary of; the importance of both communication and collaboration in thwarting financial crime; and current thoughts around the 5th Anti-Money Laundering Directive, which is being reviewed by the Financial Action Task Force (FATF). From listening to the first session on financial crime and regulator perspectives featuring speakers such as Domhnall Cullinan, and Alf Martyn, Detective Superintendent, An Garda Siochana it was clear to those in attendance that financial crime continues to be a major issue for law enforcement across the globe. The speakers were able to give background to the role played by law enforcement in their description of the Criminal Justice Act 2013. This 2013 Act brought the law into line with international standards. From here they extrapolated on two of the key areas for banks, that is, determining who is an Ultimate Beneficial Owner (UBO) and risk assessments for banks. On UBOs, Cullinan had a lot to say, including emphasising the legislation requires the definition of two diffuse points – ownership/control of an entity and on whose behalf a transaction/activity is carried out. He also reiterated that banks cannot rely solely on UBO registries but must do their own digging until they are sufficiently satisfied on the information that they are presented with. Banks must also be wary that certain jurisdictions have different views on what constitutes a UBO, and these differences must be taken account of. On this subject the panel stressed that the purpose was to inform the central bank on the measures taken to satisfy financial crime regulations, in order to fully flesh out a risk assessment it needs information from a variety of sources and must include categories of risk for different products and services, as well as customers. Their key takeaways from the morning session were that banks should monitor legislative developments and once in receipt of updates in legislation, to implement changes to ensure they remain compliant. PEPs were one of the key issues of the day, and it was great to hear so much detail come from the panellists on their approach. For me, it was important to hear that PEPs offer a level of risk, just as any customer does, and it is up to the bank to satisfy themselves that a PEP does not exceed this risk – otherwise there is no reason for them not to be onboarded once sufficient due diligence has been undertaken. As the panel members stated themselves, the 4th AML Directive provides guidance to the UK that “not all PEPs are high risk PEPs”. They have called for this lack of definition to be remedied. Moreover, they have also called for Governments to actively compile a list of PEPs within their jurisdiction. Currently, it will be up to the financial institution to identify and run appropriate due diligence on a PEP, but a central, up to date, registry, could make the onboarding process significantly easier. Working within several jurisdictions as many encompass customers do, having a strategy to manage PEPs in different jurisdictions can be challenging. It was therefore really interesting to hear that this was the focus for the second session of the day. Featuring speakers from Airbnb Payments, Mizuho Bank, Paypal and Western Union, the big themes that came out of this session were that communication and collaboration is vital in ensuring compliance. As interested parties will be aware, the starting gun has been fired on discussion surrounding the 5th Anti-Money Laundering Directive (in actual fact, updates to AML4). While discussions are at a very early stage within European bodies, initial talks have suggested there could be updates to legislation as diverse as central bank account registers, land registries, identifications of persons controlling life insurance contracts and investment related services. For my part, I will be keeping a very close watching brief on how discussions progress so that I may be able to explore this further with customers and potential customers alike. There is no doubt that there is much to take away from the day. As I discuss above, the four key points for me were around law enforcement, PEPs, Communication & Collaboration and the talks surrounding AML5. Each of these has an important part to play in the fight against financial crime. Whether it is how communication and collaboration within banks can help to ensure they remain compliant on different levels, to how banks should understand the onboarding of a PEP and the implications that will be brought about as a result of the 5th Anti-Money Laundering Directive – I am already looking forward to next year! Contact us today to arrange your personalised consultation of encompass confirm.